Happy November! Our family is hoping to do lots of crafting for the holidays this year, so I’m planning to post tons of ideas for kid-made gifts this month. Time to pull out all those craft supplies and get busy! We’re already thinking about handmade gifts the girls can make for family and friends. One of our projects is a simple and useful Post-It Note Holder. 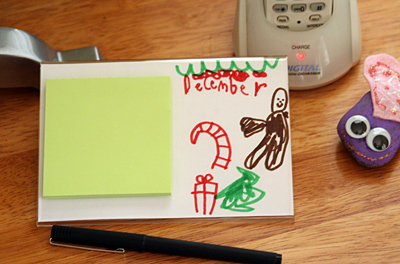 As a bonus, it features your child’s artwork or photo! Create a new piece of artwork or cut-up a collage, finger painting, etc. for your insert. 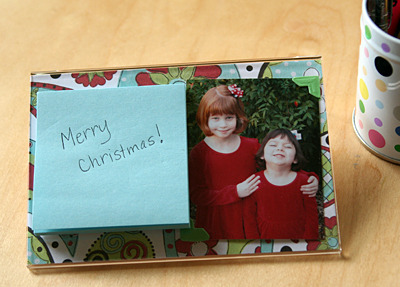 Slide it into the frame (frame is laying down) and stick your post-it notepad on top. Easy! 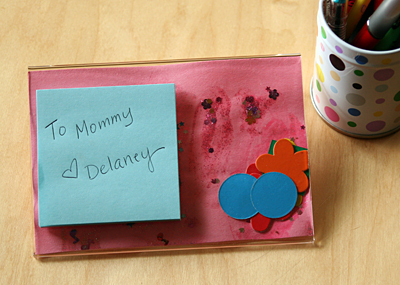 Let your toddler finger paint or watercolor a large piece of paper; cut into pieces and make lots of notepad holders! I absolutely LOVE this idea!!! Can’t wait to make some for grandma & aunts for this year’s Christmas present!!! I think we’ll make it with room for a photo of the kids together, then I can send them a new picture for the frame periodically during the year. Great idea!!! You are so creative! I love this and will be doing it for gifts this year! Thank you so much for this excellent idea! This is an inspired idea! We can DO it, too! (I mean that we can buy all the supplies.) Dad is always snagging paper from my desk for notes. I’m thinking this is a perfect idea for Sprite to make as a Christmas gift for him.